When fans sit around pub tables to discuss the club’s goalscoring greats, it is probably fair to say that the name of Bill Sowden does not crop up that often. This is a great injustice to a man that set post-war scoring records here in the mid-50s, but it is understandable, since anyone who recalls him playing for Chesterfield will probably be drawing a pension, now. Bill was born in the Gorton area of Manchester on December 18th, 1930, and joined Manchester City as an eighteen-year old from the junior side, Greenwood Victoria, in April 1949. Pacy and purposeful, Bill made his debut in a Manchester “derby,” but played only eleven times in the league for City in five and a half years there. He found local fame as one of the first City players to own a car, and would stop on the way to Maine Road to offer lifts to supporters. He registered the first City goal under the Maine Road floodlights, in scoring a hat-trick in a friendly against Hearts on October 14th, 1953. A move to Chesterfield came in November 1954, for a fee of £1,500. At just over five feet nine and weighing ten stones wet through, he wasn’t everyone’s idea of a bustling, lower-division forward, but older fans saw a resemblance in his style to another former City man who made his mark here – Jimmy Cookson. The ability to read his team-mates’ intentions was allied to a keen sense of anticipation and goals began to come from his feet with immediate effect. He finished his first season as second-highest scorer behind fellow-Mancunian George Smith, having notched 14 goals in 24 games. 1955-6 was a riot; Bill played in all but one of the games and claimed 32 goals, which remains a record for the most in any post-war season by a Chesterfield player. Only one player – the aforementioned Cookson – has ever scored more Spireite goals in one season, although Jack Lester’s 25 from ten fewer starts in his first season here stands up well, in comparison. Almost unbelievably, the one game he missed in 55-6 came through his being dropped, and it seems that the club’s selectors had rather too little patience whenever Bill went a few games without scoring. Bill’s place was less secure in 1956-7. He made only 28 League appearances but still managed 13 goals. 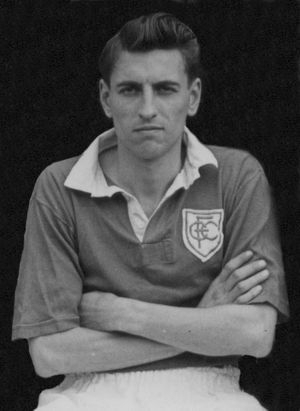 He lost his place when Gwyn Lewis was signed in February 1957, and his last Chesterfield goals were scored for the reserves against Manchester United – the team he supported as a boy. Bill was allowed to move to Stockport in the summer of 1957 in exchange for Ivor Seemley, a full-back. The Spireites needed full-backs, having taken the questionable decision to give free transfers to Freddie Capel and Tommy Flockett at the same time, but to bargain away such an accomplished goalscorer for one seemed an act of madness. The Spireites were a much weaker side, for Bill’s loss. After just one season with The Hatters, Bill moved into non-league football with Macclesfield Town, before moving on to Altrincham in 1961. Upon leaving full-time football he took over the family’s bakery business, moving to the Heaton Chapel area of Stockport, where he passed away in November 2010. For Chesterfield: 97 FL appearances, 59 goals.